When you are cutting back on starchy carbs, but not cutting them out altogether, a little filo pastry can provide a fantastic (and also quick and easy) topping for a pie. 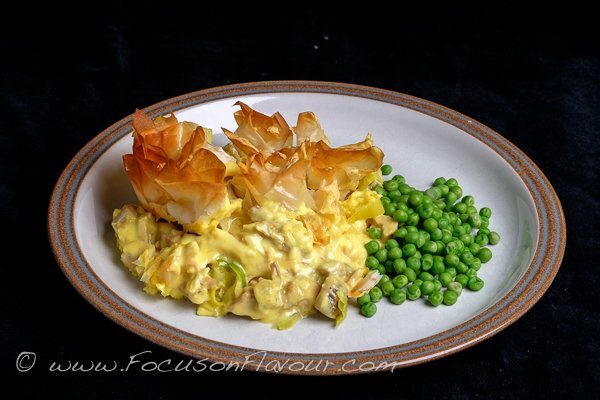 Here I have layered some softened leeks and mushrooms, followed by chopped cooked turkey, and pieces of cooked ham, topped with a creamy sauce with added golden paste. Then taking one sheet of filo per person, I cut each sheet into small squares and scrunched these up to cover the top of the dish. Sprayed or brushed very lightly with olive oil, then baked in a hot oven for about 20 – 25 minutes, until crisp and golden. This would work equally well with fish or lentils, in fact there are probably hundreds of different possibilities! This is one of my favourite things to do with the Christmas leftovers – I put up a picture last year, but here is the recipe, complete with calorie counts. You could reduce this by 100 kcal per portion by using all semi-skim milk and swapping the cheese for a tsp of tamari soy sauce. So a delicious fast day main dish at only 390 kcals! Counts would be similar if you used about 100g of white fish or cooked lentils per person, instead of the meat. Calorie counts in brackets. A lovely crunchy topping on a luscious creamy base. Mmm, works brilliantly with leftovers, or a great alternative for all kinds of pie. Layer the vegetables, followed by the meat, fish, beans or lentils, pour over the sauce and scrunch the filo on top. Quick and easy to prepare, delicious to eat! Calorie calculations are for the 'luxury' version, using cream and cheese in the sauce, and turkey and ham for the base. Melt the butter in a frying pan and gently sauté the leeks and mushrooms, until softened. Meanwhile, to make the white sauce, melt the butter in a saucepan and add the flour. Stir well and cook over low heat for a minute or so, then gradually add the liquid, stirring well after each addition to keep it smooth. Keep stirring until it comes to a simmer, then add the beaten egg, seasoning, grated cheese and golden paste and mix in well. Put the vegetables in the bottom of an ovenproof dish. Layer the meat, fish or pulses on top. Now cut the filo pastry into 3 strips and each strip into 3 squares or rectangles. 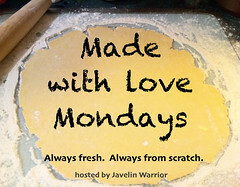 Scrunch up the pastry and distribute evenly over the top of the pie dish, then spray or brush lightly with olive oil. Bake in the oven for about 20 - 25 minutes, until crisp and golden. I used a mix of milk and cream, as that is what I had leftover. A little cream does give a lovely luxurious texture, but you could cut the calories down by using all milk. Of course, you can use non-dairy milk if you prefer. The cheese again, adds a little extra savoury kick to the sauce,and I had some scraps to use up - but for a non-dairy dish, you could add some other flavouring, such as soya, worcestershire or nutritional yeast. You could reduce this by 100 kcal per portion by using all semi-skim milk and swapping the cheese for a tsp of tamari soya sauce. So a decent fast day main dish at 390 kcals! Tangle Pie – a lighter way to top almost anything! One sheet* of filo pastry per portion and half a teaspoon of vegetable oil, I used sunflower oil. Lay the sheets on top of each other and cut into 3. Lay those on top of each other, and then cut into 3 in the other direction, so you end up with 9 small rectangles from each slice. Now, scrunch them up and lay them on top of your pie to cover the filling completely and very lightly brush with the oil. 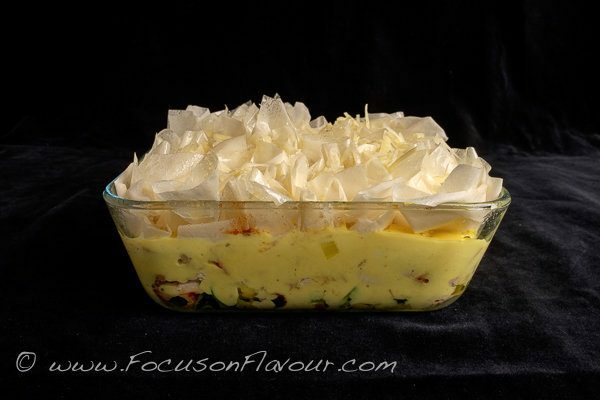 Bake in a hot oven for 15 – 20 minutes. * I have discovered that filo sheets vary a lot in size! The ones I use measure 30 x 38cms, there are 8 -10 sheets in a 250g pack, so each sheet would be between 70 and 90 calories. ½ a teaspoon of oil is about 20 calories. So adding a topping like this will be add approximately 100 calories per serving. 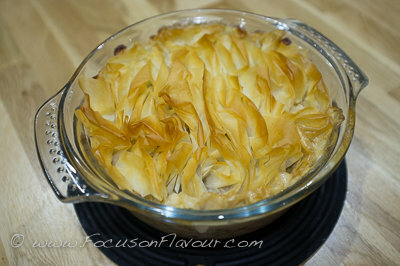 Compare that to a puff pastry topping, which would be about 300 calories!